The Aero Type 3 leather jacket that I take out the door nearly every day. The Type 3 leather jacket (so named after the popular iteration of the Levis denim jackets) has been my go-to for a while now. In years past, it’s been hard to find good ones. Traditional brands like Schott made them, and you could find them in cheap looking leather shops on not-so-great shopping streets. Occasionally, a “vintage” brand like Ralph Lauren’s RRL would come out with a version, and I’d jump on the winners. The FW2011 RRL Gambler jacket is still one of my favorite jackets, and it looks even cooler all scarred and beaten up after years of use. In recent years, the leather jacket du jour has been the double-rider, and just like full sleeves of tattoos, they’ve become so ubiquitous that the jacket that once evoked immediate images of biker gangs and leather daddies now conjures up images of corny teens visiting New York for the first time. If you are looking for the best Type 3 jacket, and one that will be built to fit you, I would forego designer versions and go to Aero, the custom leather jacket makers headed by Ken Calder, and whose work has been worn by anyone from Elton John and Blondie to Daniel Craig and Jude Law. Their work is the real deal (link to vimeo interview here). Also, Aero and Levis has a special relationship, with Aero making samples for Levi’s higher end lines. So you’re sometimes getting a premium product for less than the branded, production product. 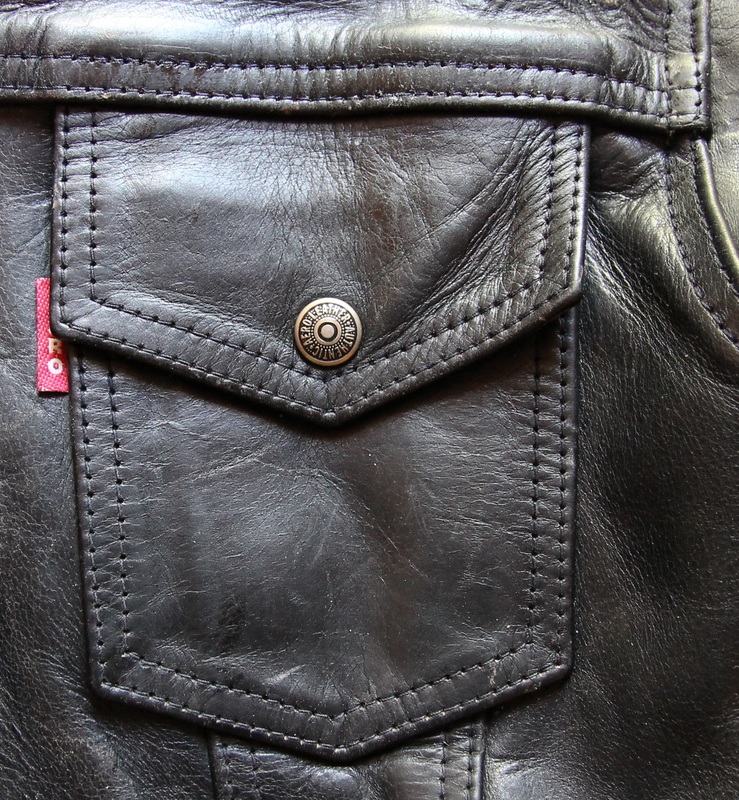 It is also one of the very few companies that does real patch chest pockets, a difficult process because of the number of leather layers that must be sewed, and especially difficult for heavier leathers. Most other companies do a ghost pocket that is set into the jacket. Not only that, but because of Aero’s special relationship with Levi’s, they are allowed to use the red tab on their jackets, something that is typically not at all allowed. Aero is one of the few companies that is allowed to use Levi’s trademark red tab, and one of the few that uses a patch pocket rather than a “ghost” pocket. Each jacket Aero builds is made by a single artisan. I like to think that mine are made by a winsome Scottish lass. And you have your choice of leather, from the super heavy Horween Chromexel cowhide that I tend to prefer (and that is one of Aero’s go to leathers), to a much lighter weight Italian, vegetal horsehide, called “Vicenza”, which is light- to middle-weight by traditional moto-riding standards. The jackets start at 550 GBP, which translates into $715 right now, and range to about 625 GBP for high-end leathers. You can’t find a better deal than than. The suede version is even a better deal, starting at 450 GBP, or $585, which is the price of a random mall jacket in 2016. You can order the leather version here, or the suede version here, but don’t be afraid to email them for more leather options. This entry was posted in News - Musings by Fok-Yan Leung. Bookmark the permalink.